Angel Customs manufactures high end internal components at an affordable price, and today we're going to go over a few of their internal upgrades for the APS/APS2 line of rifles. In my case, I'm going to be putting these parts inside a Javelin M24. Continue reading for the details on these parts, including my experiences using them in my Javelin M24! I was sent these parts for review by Evike, who is the sole supplier of these parts in the US so far. I'm reviewing three separate parts in this review, the SP150 Tune Up Kit, Piston Head and Trigger Sear Set. The tune up kit is priced at $48, piston head at $16 and trigger sear set at $40. The piston head is designed to be used with the tune up kit, and not the stock piston, so they will likely need to be purchased together. The trigger sear set doesn't completely work with the M24, and I'll explain the hiccups I had during installation later on in the review. These parts are designed to give you improved performance and durability, but without a huge monetary investment. The SP150 tune up kit should be your first purchase, along with the piston head. 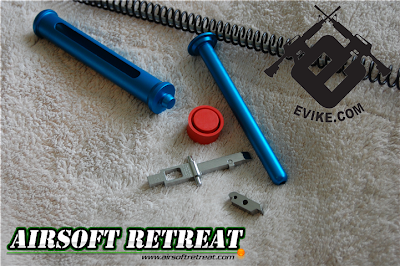 The kit includes an extremely lightweight aluminum piston and spring guide, guide rod and SP150 spring. The included piston is designed to work with a piston head like the one being reviewed today, and not a standard o-ring equipped one. The piston head is designed to expand out to fill the inside of the cylinder during firing, giving you fantastic air-seal. Lastly, the trigger sear set is made of hardened machined steel, and includes both the trigger sear and trigger connecting bar. The sear works fantastically in the M24, but the connecting bar does not fit unfortunately. Angel Customs packaged the upgrade parts well, with the trigger sears and piston head in plastic packaging with cardstock backings, and the tune up kit in a plastic bag with individual sections for the separate parts. The packaging gets the job done, and keeps everything safe and secure during shipping. As mentioned before, the tune up kit includes the base parts you need to run a hotter spring in your sniper rifle. The piston itself is a work of art, made out of machined aluminum and finished with a blue anodized coating. It is impressively lightweight, seemingly even lighter than the stock nylon piston. It has a nub at the front for attaching the piston head, and the rear has a 90 degree catch for either the stock trigger sear or upgrade unit. The spring guide is made out of a single piece of aluminum, and finished in the same blue anodized coating as the piston. It works perfectly with the included upgrade spring, but it is too large in diameter for the stock M24 spring. The included spring is listed as being an SP150, and it is noticeably longer than the stock M24 spring by a good 4” or so. I was concerned that it wouldn't fit properly in the cylinder, or if it was for another gun design, but it did fit and function perfectly. The piston head is made out of a hardened rubber and the design gives you a perfect airseal, but the rubber cushions the impact of the piston hitting the cylinder head to prevent damage to the cylinder. It fits nicely onto the piston being reviewed, and it should fit on other pistons of the same design. The trigger sear set is really designed for L96 trigger units, however the sear itself can be used in the M24 rifle. The sears are made out of hardened steel with a mirror finish. The main trigger sear does not have the lower pin installed, so you must transfer the pin from your existing sear before installation. The design of the trigger bar is totally different than the unit in the M24, so I will not be using it for this review. For the most part, installation of these parts was a smooth operation, with the previously mentioned exception of the trigger bar. The compression parts came together just fine, and everything went into the cylinder without any hiccups. The sear took a little bit of work to fit inside the trigger unit, mainly because I needed to transfer the lower pin from the stock sear, but it fit inside just fine. With my Javelin M24, I was hitting about 440 FPS with the stock components, which certainly was skirmishable, but pretty low by sniper rifle standards. After installing the various Angel Customs products, I was able to hit 489.2 FPS consistently, with a deviation of only +-2 FPS. The trigger pull still has a clean break, and the bolt isn't too much harder to pull back versus the stock spring. Durability should be improved over the stock parts, and you should be able to run hotter springs than the SP150 included with the tune up kit. I was happy when I received the Javelin M24, because I knew it would be a good test bed for aftermarket parts such as these ones made by Angel Customs. Almost everything worked perfectly, with the exception of the trigger bar, and I saw a decent bump in FPS over the stock components. I'll probably be increasing the spring strength, to really test out these parts, but for now, it's a great starting place.